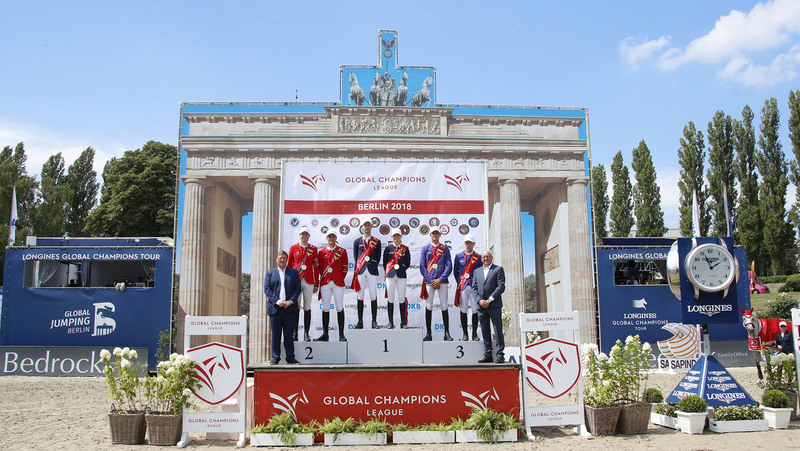 It all came down to the final fence at GCL Berlin today, after Valkenswaard United dramatically lost their lead to St Tropez Pirates in an edge-of-the-seat battle in Germany's capital city. Edwina Tops-Alexander and Pieter Devos kept cool under pressure to secure the only completely clean score of the weekend, taking a second win this season as they look to cement their place in the GCL Super Cup and GC Prague Playoffs this December. In a heart-wrenching turn of events, the final fence of the day cost United the win, and the team finished third just behind ranking rivals London Knights - the overall leaders pulling out a perfect double clear today to finish second and add to their lead where they sit on 244 points. Frank Rothenberger put together a tough track to test the teams, full of 1.55m tall verticals and wide oxers which required power and precision in perfect harmony around the unusually shaped oval arena. The course included a gappy Sapinda vertical with a wavy top pole, a wide DKB oxer with a water tray underneath, an imposing wall featuring the Brandenburg Gate, and a tough, full height Longines double of oxers to finish. Fans packed every inch of the grandstands, lining the grassy banks of the arena, with the atmosphere electric in the natural amphitheatre as they cheered on the team riders - the sunshine and warm temperatures providing the perfect backdrop to a day of top sport. The horses were fresh, with air conditioned stables and a cool indoor warm up arena allowing them to perform at their absolute best. Miami Celtics made a strategic swap, fielding Cameron Hanley and Eis Isaura alongside Denis Lynch with RMF Bella Baloubet. Just a single time fault from Denis would mean the team stayed on a score of 7, and would hope to rise up the final result. The Scandinavian Vikings fielded an all German line-up, with new recruit Mario Stevens with Credo picking up four faults, but teammate Christian Ahlmann and Ailina backing them up with a beautiful clear to keep the team on a combined score of 8 faults, slipping just behind the Celtics. Overall ranking leaders London Knights knew that only a double clear would keep them in with a chance of finishing ahead of Valkenswaard United, and increase the pressure on their rivals. Martin Fuchs lead the way with top horse Clooney, delivering a brilliant clear before passing the reins to Olivier Philippaerts with the shorter striding H&M Legend of Love. And they pulled yet another clear out of the hat - the first team to manage two clears today - to keep the team at the sharp end of the grid. Underlining the intensitiy of the rivalry between Knights and United, Olivier said: “We knew we both had to go clear and be aware of the time. Let’s hope they have a rail and we can stay ahead of them!" Shanghai Swans came into today’s competition on a score of 1, and there was further heartache after Daniel Deusser and Calisto Blue clipped the final fence - groans going up all around the arena. Pius Schwizer put in a valiant try with Chidame Z, jumping clear and keeping the team on a score of five. Lorenzo de Luca of the Rome Gladiators picked up four faults as Jeunesse van t Paradijs clipped the fence put all the pressure on the shoulders of Constant Van Paesschen and the 9 year old stallion Jilbert van 'T Ruytershof. But the Sapinda vertical fell, despite Constant’s brilliant management of the enthusiastic horse, and the team dropped down the order with a team total of eight. The London Knights would now start their charge up the results board. Home city team Berlin Eagles entered the ring to a roar of approval from the local crowd. Christian Kukuk, the man who has been so consistent for the team, kept his cool with Cordess to deliver yet another clear for the team, with Ludger Beerbaum next to tackle the course. But a pole down from the German maestro with Casello meant the team would slip behind the London Knights, who again looked to be rising formidably up the rankings. Tactics paid off for the St Tropez Pirates after Edwina Tops-Alexander opted to compete again with her on-form mare California, her horse flying around the course and well suited to the fast paced arena. The pair delivered a masterful clear, before Pieter Devos and Claire Z took centre stage - the Belgian rider making a tactical change to swap horses for this competition. Remarkably the pair clocked exactly the same time, to the millisecond, as Edwina - keeping the team on a completely clear score and ahead of the Knights. Final team to go Valkenswaard United had all the pressure on their shoulders - only a fast double clear would win them the Berlin leg of the Championship. And it was a win they so badly wanted to help their campaign to take the top spot from the London Knights. Marcus Ehning entered the arena to applause from the crowd, and quickly proved the epitome of grace under pressure as he piloted Comme il Faut to a brilliant clear, setting up teammates Alberto Zorzi and Fair Light van T Heike. The duo looked strong, flying around the arena in good time as they approached the final line - a win in their sights. But it all came down to the final combination, the second Longines oxer at the double proving a push too far and groans went up all around the arena as the pole fell, dropping the team to third and securing the win for St Tropez Pirates - their second of the season. The GCL now looks to London, where home city team and overall ranking leaders London Knights will be looking for another podium result to cement their place in the Championship lead. Pieter Devos, St Tropez Pirates, 1st place: “We did a good job today. I decided to bring my two best horses here and I alternated who I rode - for me it was a good decision to come today with a fresh horse. She was amazing so I’m very happy. We both decided to go for the team result and not think about the individual result and that’s why we got double clear. The course designer did a super job - there were faults everywhere and it was really good sport right to the last fence.